Running my business and taking on early morning Ballet Blast clients has drastically changed my morning routine. Sleeping-in and eating a leisurely breakfast is a fantasy I don’t get to live all too often. With 5am starts, breakfast has to be quick and easy enough I could make it in my sleep, literally! The recipe I’m sharing today is my answer to an early morning, the ultimate balanced breakfast before you go. Quaker Oats have just launched their new Oats So Simple Protein and kindly sent me a box to experiment with. With my long days doing hours of physical activity, getting a good quality plant based protein in my diet is really important to me, and this a great way to do that. With an ingredient list of just Oats and Soy Protein – it’s easy to add in lots of different flavours. 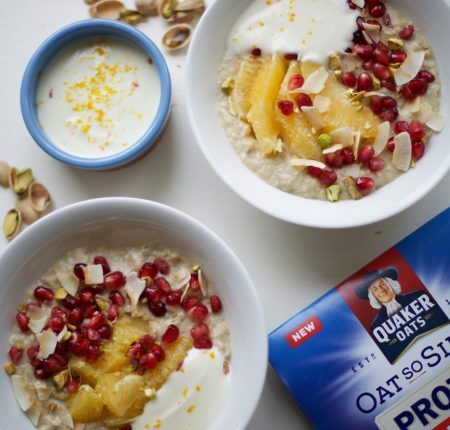 To salute the wonderful ingredients that make this festive season, I added orange pieces, pomegranate seeds, flaked coconut, roasted pistachios and a dollop of Vanilla coconut yoghurt to the equation for the most delicious start to the day. 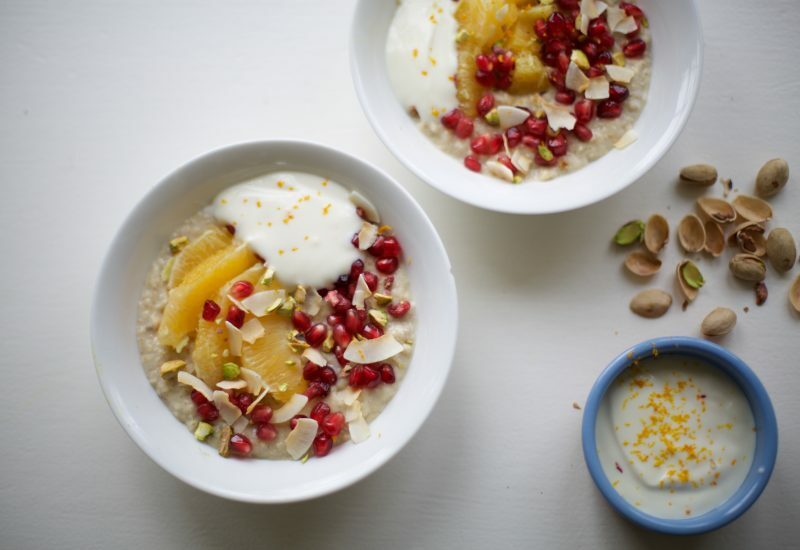 As the mornings become increasingly darker, and the weather turns colder the only thing getting me out from the comfort of my bed is the idea that this warming bowl of porridge, isn’t too far away. 1) Start by preparing the Orange. First zest the orange, before cutting the orange in half. For the first half – peel and segment the orange pieces leaving the other half orange on the side for late use. 2) Measure out all other toppings. 3) Add 190ml of Oat Milk into a pan (or microwave if you’re short on time) with x1 sachet of Oats So Simple Protein. 4) With the untouched 1/2 an orange, squeeze two tablespoons of orange juice into the pan. 5) Add to the hob and keep on stirring for 2-3 minutes until cooked. 6) Spoon into your bowl and tops with the Orange slices, Orange zest, Pomegranate seeds, Pistachio nuts, grated coconut and finally a dollop of Vanilla-Coconut Yoghurt.